Lets imagine a scenario: you’ve levelled to 85 with a dps spec, and want to try a hand at healing. You googled “druid healing” and feel kind of overwhelmed. You’d like to have some idea of what you’re doing before you set foot into an instance, but you don’t want to spend hours researching it. The aim of this guide is to lay out the basics of druid healing. First thing you need to do is have a restoration spec, so lets look at that briefly. Honestly, there’s no real ‘cookie cutter’ build for restoration druids at the moment. However, most resto druids will take some variation on the one above. For explanations of how these talents work, read Appendix 1 below. I’ve split these off in an effort to keep this as short and simple as possible, but knowing (even vaguely) how your talents work WILL make you a better healer. All are pretty self-explanatory, except maybe for the first one. Swiftmend, Rejuvenation, Regrowth, Lifebloom, Wild growth, Nourish, Healing Touch, Tranquility. Also within easy reach: Dispel corruption, Barkskin, Cyclone, trinkets. All the other spells I use regularly (but that I have time to glance at my keyboard before use) I have bound, but on lower priority keys. Healing five man dungeons (and raids) is lots of fun as a druid, especially if you can master healing on the move and anticipating incoming damage. Here’s the basic priority/strategy I use for healing. There are lots of variations on this, so feel free to experiment, but here’s what I do. Keep 3 stacks of Lifebloom (LB) up on the tank all the time. I even try to keep it up between pulls, unless I have to drop and drink. Just casually casting it a couple of seconds before it falls while I’m walking to the next group. If it drops, try to build it ASAP so it’s rolling at 3 before the pull. Keep Rejuvenation (RJ) up on the tank if they are taking damage. This is both for the actual heal itself, PLUS for the mastery bonus it will give to LB, so both spells will be stronger. PLUS it means you have something to cast Swiftmend with. Use a direct heal to refresh LB if I have time (about 3 seconds for me) otherwise refresh with another LB. Any of Regrowth, Healing Touch or Nourish can refresh LB. I use Nourish by default (it’s cheap! ), but ramp up to Healing Touch if the tank is taking a lot of damage, or Regrowth if I want a haste boost before heading into HT/NR spam. Cast Wild growth (WG) whenever two or more people have taken any damage. As explained below, this spell is cheap: don’t be afraid to splash it around willy nilly. Use Omen of clarity procs (clearcasts) to cast Healing touch (HT) or Regrowth (RG). 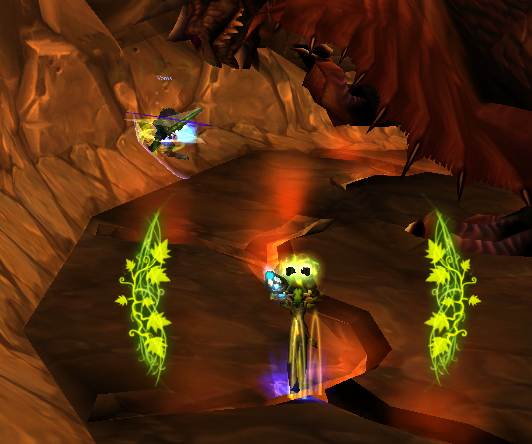 Clearcast procs make a noise and pop two green leafy arcs around your character. The RG/HT can be on a party member that needs topping up, or as a tank heal. Don’t be afraid to cast these spells out clearcasts, but be *wary* as they will burn your mana fast. Use Swiftmend (SM) whenever someone with a HoT needs a top up, or if there’s a clump of people that could benefit from Efflorescence. This will often end up being a SM on the tank that benefits the tank and the melee. Remember if you want to SM someone, they need a HoT, so you may need to RJ them first. Dispel stuff. Dispelling is mana-expensive, but often cheaper than healing through the damage. Knowing what to dispel and what’s not worth the mana/GCD takes practice, but in general it’s worth dispelling most curses, poisons and magics (if you’re specced into that). During heavy AOE phases, pop Tree of life (treeform) and systematically cast LB across the whole party. Use your lovely treeform clearcasts to cast Regrowths on the lowest health party members, then go back to layering LBs. This is good especially for fights where you’re on the move, or if you are low on mana. Don’t forget the tank during treeform! During extreme heavy AOE phases where you can stand still, cast WG then Tranquility. If the group is still low after TQ, throw another WG then start RJing the party, starting with the lowest health members. This will burn your mana fast. If you aren’t keeping up, and you’re out of cooldowns, there is a possibility that the group is DOING THE FIGHT WRONG (see here). When I fall below 70% mana, I cast innervate on myself. Unless I’m in the last couple of trash pulls before a boss, where instead I’ll start dropping and drinking, to save Innervate for the boss encounter (so it helps to know the instance). Make sure you visit the nearest innkeeper and buy three stacks of water, and keep topped up 🙂 you tend to go through a lot of water when you start out. There are more details about how I heal specific encounters in 5 man dungeons here: Glow’s Dungeon guides. For more details about my tank/party healing, and the lessons I learned healing my first heroics, read here: Healing heroics – a druid’s perspective. For more details about the talent choices and spells used above, read the appendices below. For more details about healing raids, managing mana, setting up macros, mouseovers and add ons, … well that’s to come in part 2. The ultra-short description of the talents taken in this build (and a couple of others that you might consider) with little star ratings: * = a weak talent; ** = a good talent; *** = a very strong talent. Different talents are stronger or weaker in different settings, I’m assuming you’re just starting out and are healing 5mans when assessing these talents. Blessing of the Grove Generally thought a weak investment of two talent points, considering the small boost. Natural Shapeshifter * A weak talent, but a prerequisite for Master Shapeshifter, so a must-have anyway. Naturalist *** Reduces the cast time of our main two direct heals. Master Shapeshifter *** More healing for all of our spells. Improved Rejuvenation *** A big boost to one of our main HoTs and to Swiftmend. Living Seed * Considering that most of our healing comes from HoTs, and also our crit rate is quite low – this is considered a weak investment of points… but is a prerequisite for Efflorescence so it’s usually taken anyway. Revitalize *** This gives you a nice chunk of mana back when casting your main two single target HoTs. Also gives the whole party/raid mana regen when you cast Lifebloom. Nature’s Swiftness Generally considered a weak cooldown now as it’s comparable to Swiftmend in power and we can do those much more often, but some druids still take this and use it effectively. Nature’s Bounty ** This talent is strong if you use Regrowth a lot – which you do in tree form if you use it well. It’s also strong for raid healing if used well. For 5man dungeon healing I’m actually tempted to rate this a 1-star, but your mileage may vary. Empowered Touch *** The lifebloom refresh component of this talent is very powerful, and well worth training yourself to use. Malfurion’s Gift *** Gives you free spells when you cast or refresh Lifebloom. This is really powerful when used well. Efflorescence ** The green circle that appears when you swiftmend someone. The heal from this is weak at the moment, but is being revamped for 4.1, so worth taking if you want to learn how to use it. Wild Growth *** Our bread and butter AOE hot. Nature’s Cure ** Being able to dispel magic is great for 5mans. You may or may not need this for raiding, depending upon your setup. Gift of the Earthmother ** Gives our Rejuv an instant heal upfront, and lets the Lifebloom ‘bloom’ heal for more. This is a play style choice; some druids take a point or more in this, others not. Tree of Life *** Our main AOE healing cooldown. Besides the other benefits, treeform’s main power is that it allows you to cast Lifebloom on everyone – creating lots of clearcasts you can use to cast instant free Regrowths as well. Nature’s grace *** A strong haste boost when you cast regrowth. It has an internal cooldown of a minute, but it’s very strong when used well. Nature’s majesty * A weak talent, with crit being quite weak for us, but better than the pure dps talent in the same tier. Moonglow *** Significantly reduces the mana cost of all of your damage and healing spells. Most put 2 or 3 points here. Furor *** Boosts your mana pool. It’s usual to put 2 or 3 points here. The spell descriptions that follow are for the basic, unhasted versions of the spells, assuming the talents and glyphs outlined above. Lifebloom (LB): lasts for 10 seconds, ticks every second, stacks three times. Once you’ve built a stack you can keep the entire stack rolling just by refreshing once before it ends. When it expires it ‘blooms’ doing a largish heal, but then you have to rebuild your stack. You can only cast this one target at a time (unless you’re in treeform) so it’s usual to keep it on the tank, and to keep it rolling all the time. Aside from it being a very strong healing spell, having it up all the time means that you will be maintaining mana returns from Replenishment, Revitalise and creating Omen of Clarity procs. There’s a bit of a mantra of ‘don’t let lifebloom ever bloom’ around the traps. This is true in *general* but the bloom makes a good emergency heal for if you are stunned/silenced or go out of range of the tank. Rejuvenation (RJ): lasts 12 seconds, ticks once every 3 seconds. Swiftmendable. Our bread and butter party/raid HoT. Wildgrowth (WG): lasts 7 seconds, ticks every second, 8 second cooldown. This is an AOE that’s targettable on a player or a hostile target. The target marks the centre of its 30 yard radius, but your target isn’t guaranteed to be hit with the HoT; the 6 lowest health party members in range are chosen (including pets). This spell is CHEAP. It’s only a bit more expensive than one RJ – so whenever you have more than one person taking damage, use WG. You should be using WG often, in AOE damage situations, it should be cast every cooldown. Tranquility (TQ): An 8 sec channelled AOE heal that chooses lowest health targets and applies a direct heal + a HoT. This is a very powerful AOE heal, with an 8 min cooldown (soon to be talented down to 3 min in patch 4.1). Use this in any boss fight with a heavy AOE damage component where you know you don’t have to move. Also use this in ‘likely wipe’ scenarios on a bad trash pull. Two handy tips for TQ: as it’s channelled, it can be interrupted/pushedback – so cast barkskin first if you are being hit. Also, TQ benefits from our symbiosis mastery – so casting WG just before TQ will give your TQ a nice boost to its power. Efflorescence (Eff): A 7 second, AOE HoT that’s centred on your Swiftmend target. Currently (4.0.6) a fairly weak AOE heal, but a nice additional AOE HoT in situations where a few people are clumped. Nourish (NR): Our ‘elcheapo’ Direct heal. If you have a HoT on your target, it’s same efficiency as Healing Touch (give or take) so better used in situations that might overheal – such as for refreshing LB on a tank. Really needs a HoT up on its target to be truly useful, so when used for party healing, best if you throw a RJ on your target as a first call. Healing Touch (HT): Our ‘big’ direct heal. Best saved for clearcast procs, or when the tank is taking lots of damage. Regrowth (RG): Our ‘flash’ heal. Expensive, and leaves a short HoT on the target. Swiftmendable. Best cast to use up a clearcast proc, especially in treeform, when they also become instant cast. Swiftmend (SM): Our resto ‘special’ direct heal. A cheap instant cast with a 15 second cooldown, but requires either RJ or RG on the target. Also procs Efflorescence if you’re specced into that. Great to use on the tank as part of your stand ‘rotation’ especially when they are taking lots of damage. Also useful for healing people when you’re on the move. Cast a RJ then SM it for a quick heal in spike damage situations on other party members too. 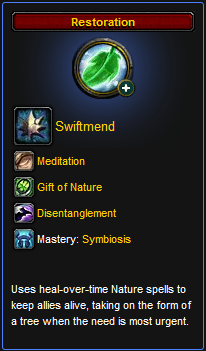 Unfortunately, Swiftmend also consumes Omen of clarity. As it’s cheap, try to train yourself not to swiftmend during a clearcast proc, unless it’s absolutely the best spell for the job at the time anyway. Omen of Clarity: If you have Lifebloom rolling, you should get a fair few Omen procs (also called clear casting). This means you have 8 seconds during which the first Healing Touch, Regrowth or Swiftmend you cast will be free. This shows as two leafy arcs, and a distinctive ‘ting!’ noise (see below). As discussed above, try to use these clearcasts on Regrowth or Healing Touch. In-built aura for Omen of clarity (clear cast) proc. Very nicely done, Glow. Shared it with my readers as well. WOW! Incredible guide – simple and still pretty darned comprehensive. And just what I have been looking for and failing to find until now. Thanks so much…and if you don’t mind, I will link it on my class mechanic page. Thanks for your feedback – and I really hope it’s useful! 🙂 Also thanks heaps for adding to your class mechanics guides! Once small fix – Step 4 #7 should say “..but in general it’s worth dispelling most curses, poisons and magics” (not diseases). Thanks Pam! (Can you tell I added that bit later? *cough*!) “And through the magic of the internet, it now says poisons”. I have no idea why I put Pam (and the wrong blog address) on that comment. Oops. *Bows before the infinite wisdom of Glow. Well written, concise and easy to digest. I commend you for this work, it’s outstanding! And please excuse my horrible typing, I am working at the same time lol. But seriously, oustanding guide, I think it’s something many resto druids will refer to in the near future! Thanks Mhogrim, I’m hoping it’s useful 🙂 And horrible typing at work is my forte – so good to know I’m not the only one!